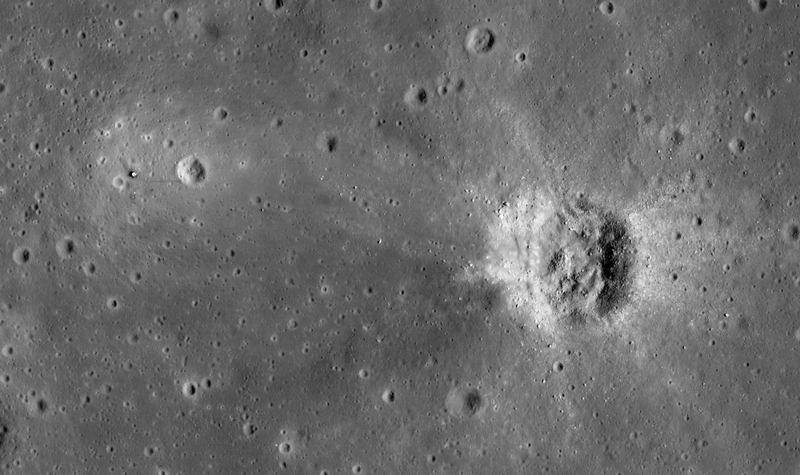 The National Air and Space Museum will open its newest exhibition, “A New Moon Rises: New Views from the Lunar Reconnaissance Orbiter Camera,” Feb. 26, displaying dramatic landscapes of the moon captured by the Lunar Reconnaissance Orbiter Camera (LROC). The images showcase everything from Apollo landing sites to majestic mountains that rise out of the darkness of the lunar poles. The exhibition will be open through December at the museum in Washington, D.C. The 61 large prints in the exhibition reveal a celestial neighbor that is surprisingly dynamic and full of grandeur and wonder. 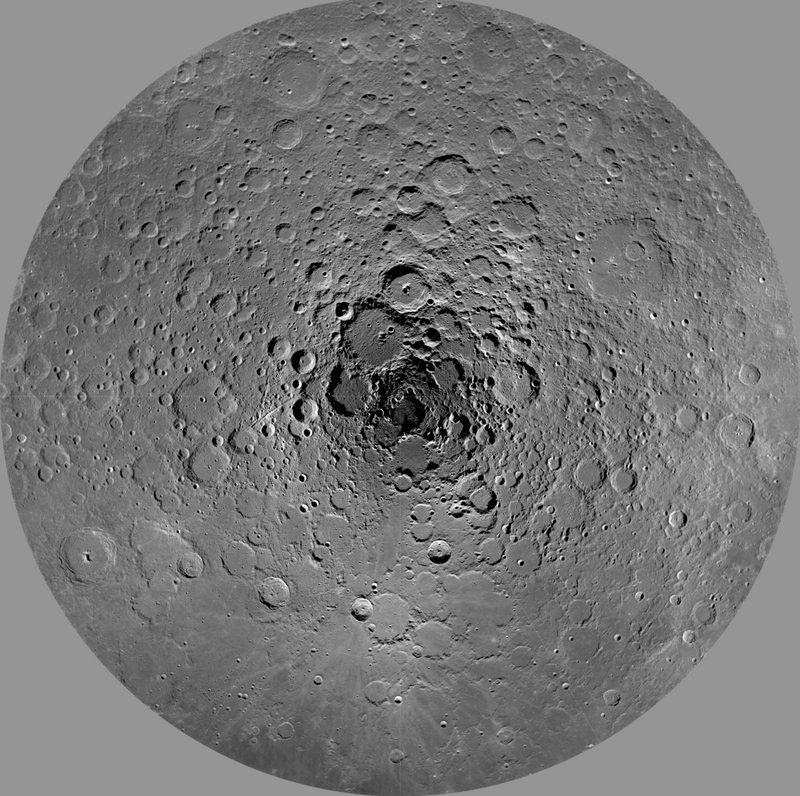 The more than a million images from LROC are reshaping scientists’ understanding of the moon. They reveal newly formed impact craters, recent volcanic activity and a crust that is fractured by the shrinking of a still-cooling interior. NASA launched the Lunar Reconnaissance Orbiter in 2009, and it is managed by NASA’s Goddard Space Flight Center. Part of its primary mission is to help prepare NASA to send astronauts back to the moon; its other mission is scientific research, exploring Earth’s nearest celestial neighbor in ways never before possible. Mark Robinson at Arizona State University’s School of Earth and Space Exploration is LROC’s principal investigator, and he partnered with the museum to make the exhibition possible. “A New Moon Rises” is divided into six themes: Global Views, Exploration Sites, Discoveries, Vistas, Topography and Craters. These themes helped to determine which of the thousands of images taken by the LROC would be chosen for display. Visitors will also see new images from LROC projected on a large screen that will be updated daily. The exhibition includes a display of spare LROC cameras and a large 3-D model of a young lunar crater. The National Air and Space Museum building on the National Mall in Washington, D.C., is located at Sixth Street and Independence Avenue S.W. The museum’s Steven F. Udvar-Hazy Center is located in Chantilly, Va., near Washington Dulles International Airport. Attendance at both buildings combined was 8.5 million in 2015, making it the most visited museum in America. The museum’s research, collections, exhibitions and programs focus on aeronautical history, space history and planetary studies. Both buildings are open from 10 a.m. until 5:30 p.m. every day (closed Dec. 25). Sea of Tranquility is where Apollo 11 astronauts landed on the Moon in 1969. Lava flows have spread across the floor of this large collapsed area. 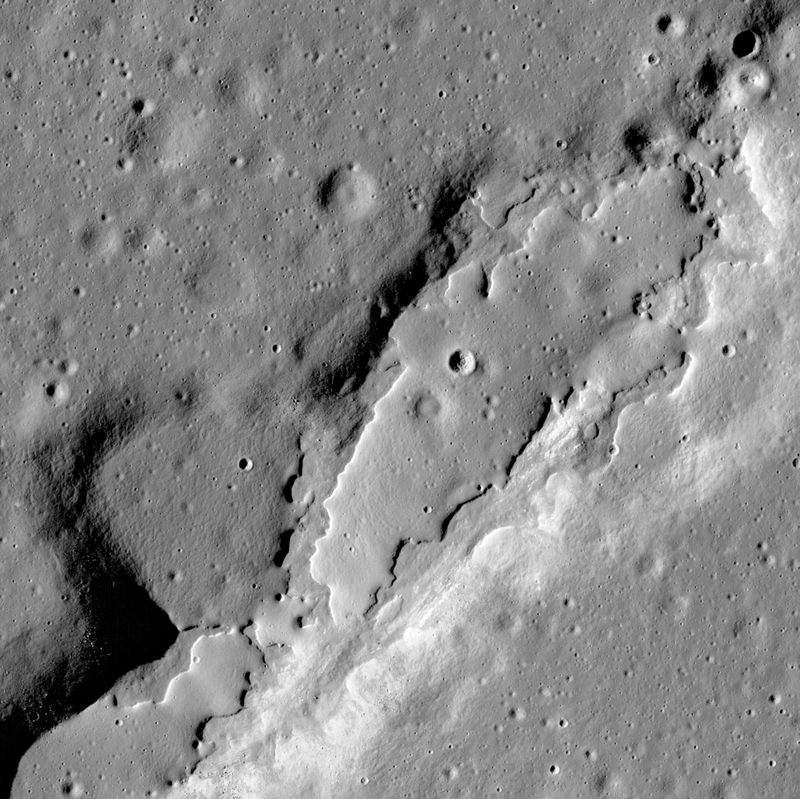 Their lack of impact craters and steep sides show that they erupted relatively recently. In this striking view of one of the Moon's craters, the height and sharpness of the rim are evident, as well as the crater floor's rolling hills and rugged nature. At the Moon's poles, the Sun never rises high above the horizon. Long shadows make mapping these regions difficult. 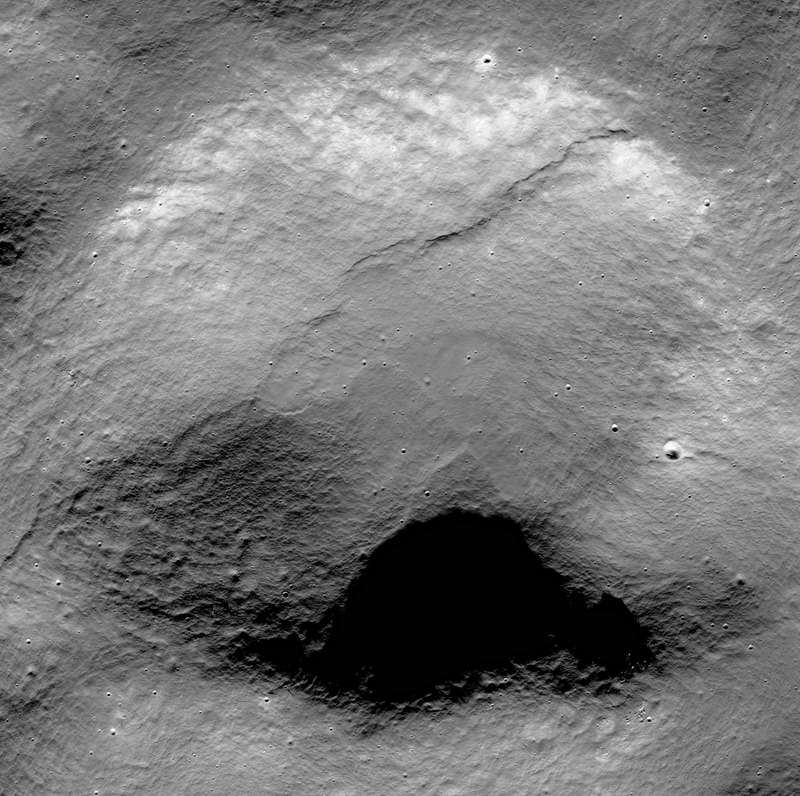 A band of rugged mountains form a rough central peak ring in Schrödinger Basin. 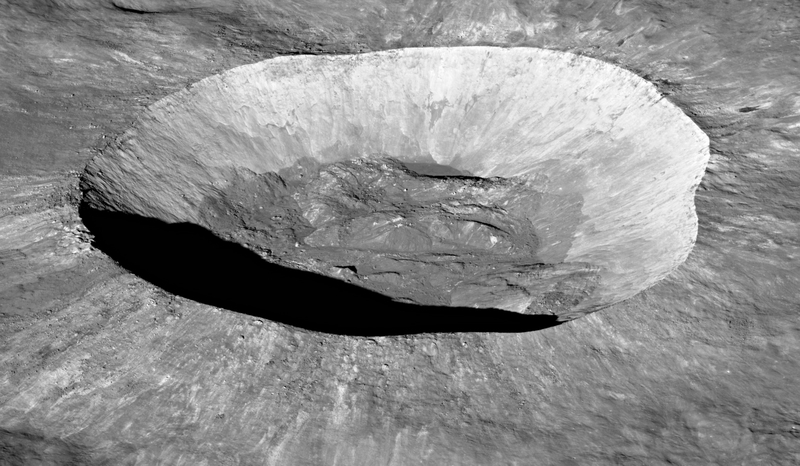 Thousands of small cliff-like features discovered in Lunar Reconnaissance Orbiter Camera images provide evidence of a shrinking Moon. In this view of the Moon, the South Pole is at the center. The colors represent different elevations. 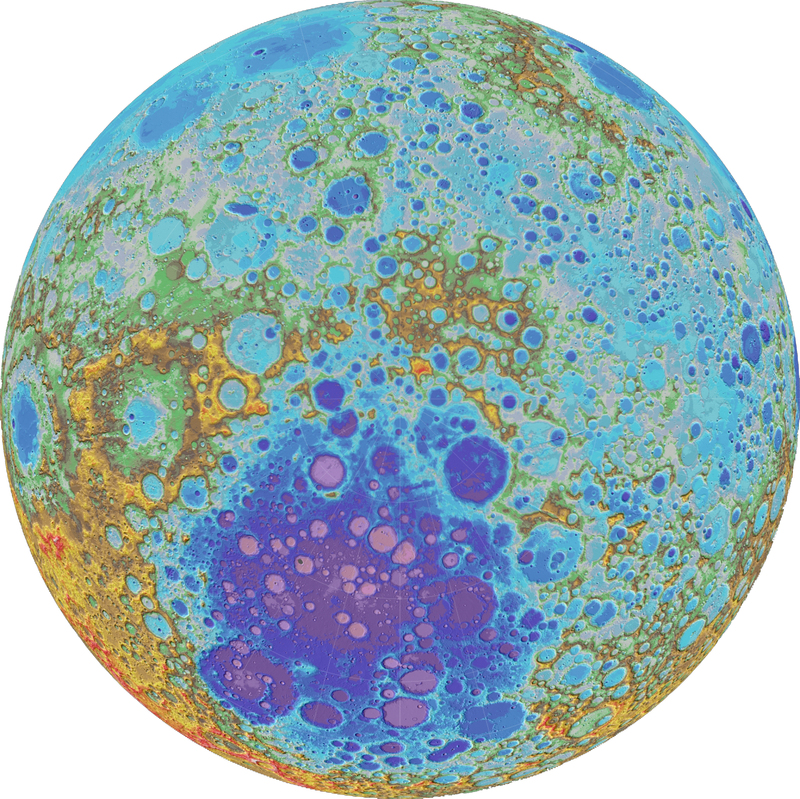 The large, roughly circular, low-lying area (deep blue and purple) is the South Pole–Aitken Basin, the largest and deepest impact feature on the Moon.